She’ll shine extra bright in IZ Amy Byer clothing. 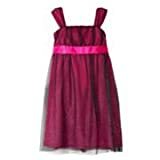 Fun features like glittery and shirred details make this girls’ Emma dress a fabulous find. For more dressy apparel, shop our selection of girls’ dresses and skirts. In fuchsia.